Recovery advocate, writer, and proud father of a person in long-term recovery. Last week my wife and I had the rare pleasure of attending concerts on consecutive nights. The first one involved one of the biggest names in rock and roll. The second one involved 19 kids you've never heard of. Which one do you think we enjoyed more? On Thursday, we decided on the spur of the moment to go online and buy a pair of incredibly cheap tickets for the Bruce Springsteen show at the Palace of Auburn Hills in metropolitan Detroit. We figured anytime you can see "The Boss" live for only $17 a ticket, you have to jump at the chance. So we did. And we had a fabulous time. 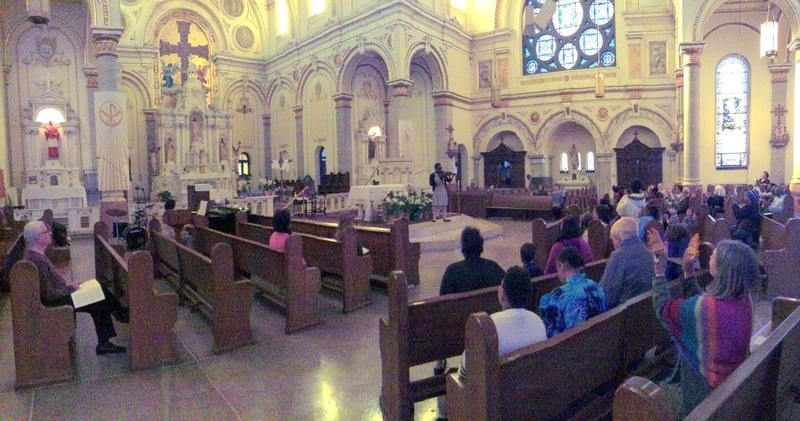 The next night, we made our way to St. Charles Borromeo Church on Detroit's east side. The concert happening there was much smaller in scale, and nobody was selling tickets for it on StubHub. But that didn't stop it from being one of the most fulfilling musical performances we've ever seen. The performers my wife and I watched and listened to last Friday night were the kids of Detroit Youth Volume (DYV), an amazing organization that teaches disadvantaged kids from the city of Detroit how to play the violin using the Suzuki Method--for free. On this night, the group held its annual Solo Recital, and 19 of its 21 current members participated. Pairing underprivileged city kids with violins may seem unlikely to some, but not to DYV founder/director Clara Hardie. She told The Detroit News back in December that one of her goals is to "change the face of the Suzuki world." The "Suzuki Method," created by Japanese violinist Shinichi Suzuki more than 50 years ago, applies the basic principles of language acquisition to the learning of music. Some of the concepts it employs are parent responsibility, loving encouragement, and constant repetition. "The foundation of the Suzuki Method is that every child can learn," Hardie told The Detroit News. "And in my head I'm thinking 'regardless of race or class.'" So in 2010, Hardie, a city of Detroit resident, founded Detroit Youth Volume and began teaching kids from Detroit's Capuchin Soup Kitchen and surrounding neighborhoods. The Suzuki Method requires commitment, not only from the students but from the parents as well. "It's a bigger commitment for the parents than for the kids," Hardie says. "They have to come to every class, take notes, and facilitate daily home practice." Because of this, DYV assists the parents of its students by providing gas cards to help pay for transportation costs. And if parents don't drive, they can even take advantage of a van service. Detroit Youth Volume's students get both group and individual lessons from the program's four teachers, who include Hardie, Jeff Harris, Ashley Nelson, and Scott Murphy. They meet on Monday and Friday afternoons in the basement of the church, where Hardie strives to make learning fun. One way she does that is by having hip-hop artists work with the kids. Adding hip-hop beats to standards like "Twinkle, Twinkle Little Star" creates a fresh new sound. "We're trying to expose the kids to other artists of color in their own city who are creating social change using music and art," Hardie explains. "The kids can see themselves in those adults and the adults can see that our kids are really special." What Detroit Youth Volume is doing for the kids of Detroit is indeed special. By building a positive learning environment, DYV encourages in its students confidence, self-motivation, emotional expression, empathy for others, grit, and mastery. All of those things will help these children succeed going forward, both in music and in life. The culmination of DYV's collaboration with hip-hop artists will come with the recording of their hip-hop violin album, which has been funded in part by a crowd-sourcing campaign that raised more than $6,000.00 on Kickstarter. The group will give the public a sneak-peak of those sounds when they perform a concert at Jack White's Third Man Records store in Detroit on Saturday, May 21. You can bet my wife and I will be there.